Sometimes, after achieving a certain level, an artist makes a slight regression before hitting the heights of greatness. Such an arc is apparent to me after having watched Federico Fellini’s 1953, black and white Neo-Realist film, I Vitelloni (roughly translated to mean The Idlers or The Loafers). While better than his debut film, 1950’s Variety Lights, it is also better than his more lauded film, 1954’s La Strada (despite the lack of Fellini’s wife, Giulieta Masina). None of these three films touches greatness, but I Vitelloni is clearly the best of the three. Even though it is a melodrama, a soap opera, its humor and pathos carry it a long way, and its influence can be felt in American films as diverse as Mean Streets, The Lords Of Flatbush, and Diner, all films about young male bonding, and its ending (the last scenes of one of the Vitelloni leaving town) wholly rubs against the melodramatic grain of the film and reaches true drama, whereas the end of La Strada, possibly a better film, up until the end, sinks below the earlier film with its over the top histrionic ending. The tale of the 100 minute long film is rather simple, and follows the lives of twentysomething idlers in a seaside Italian village, as they waste their lives pursuing, well, nothing of consequence. There are clearly autobiographical elements in the film (which has an omniscient narrator- Fellini himself), which center upon Fellini’s youthful escape from his own town of Rimini; but the rapport between the young male actors makes the films hodgepodge work. The film opens with a party, where Sandra Rubini (Leonora Ruffo) is elected Miss Siren of 1953. This is because she is pregnant, via a repugnant Lothario named Fausto Moretti (Franco Fabrizi), whose father forces him to marry her, to save family honor. Throughout the film, though, he flirts and has affairs with all sorts of women- a married gal at a movie theater, his boss’s mousy wife, a girl he picks up at a café, women at parties, and so on. This eventually leads Sandra to leave him, causing him to panic and search the city for her, only to find her at his father’s, where his old man beats him for his faithlessness. Moraldo Rubini (Franco Interlenghi), Sandra’s brother (and Fellini’s avatar), is friends with Fausto, and covers up his pal’s lies to his sister, and also helps Fausto steal an angel statue from the employer that fires Fausto after he fondles his wife. This leads to a great scene, where the village idiot is left in charge of the hot merchandise, and seems drawn to it like a cat to catnip. He ends up being the only one of the idlers to pursue his dreams, by leaving town. Riccardo (Riccardo Fellini- Federico’s brother) is given the least screen time. He’s a wannabe actor and singer who’s basically support for the others. Alberto (Alberto Sordi), is the buffoon, who lives with his mother and sister, Olga (Claude Farell), who sleeps with married men. Leopoldo (Leopoldo Trieste), is a poet and playwright who revels in melodrama and clichés. He seems almost set on giving up his dreams until a hilarious episode with an old homosexual man, who’s a famous actor, Sergio Natali (Achille Majeroni) who quid pro quos the young man- he will set him up with a play production, if the young man will go to the beach and have sexual relations with him. The film culminates with the search for Sandra, and Moraldo slipping away in the early morning, as his friends sleep on. This ending is accentuated by the movement of the camera in each of the Vitelloni’s bedrooms, which, along with the sound of the train, visually shows Moraldo leaving it all behind. The film was a smash hit, financially, and saved Fellini’s career. It won the Silver Lion at the 1953 Venice Film Festival, and was nominated for a Best Original Screenplay Academy Award in 1958, after Fellini had done several more films, including La Strada and Nights Of Cabiria, which had established him as one of the great film directors on the planet. The film also contributed the slang term vitelloni to the Italian language. Literally it means a side of meat, but derogatorily it implied lazy young men. Several years later, due to the global phenomenon of La Dolce Vita, the term paparazzi would also enter the Italian language, and other languages, as well. Fellini does a good job of stringing ‘episodes’ together into a narrative- a form he’d perfect in La Dolce Vita. The screenplay, penned by Fellini and Ennio Flaiano, from a story by that duo and Tullio Pinelli, never slams home the melodrama. The comedy is all within character, and while there is not the gravitas of later Fellini films, nor the earlier films of Vittorio De Sica, there are moments of real drama, beauty, and pathos. The film’s score, by Nino Rota, never intrudes, and is his usual good work for being so, and accompanying the drama, not milking nor foreshadowing it. The cinematography, by Carlo Carlini, Otello Martelli, and Luciano Trasatti, does not dazzle, but does not bore, either. All in all, technically speaking, the film is in fine form. The DVD, put out by The Criterion Collection, is a solid package, if not the top of the line. Unfortunately, there is no English dub option, although the film originally was released in America with a dubbed soundtrack. Also missing is a film commentary; and this is a good, pivotal film in Fellini’s career, so it really demands the attention of a good film historian and/or critic. The company did do a good, if not pristine, job of video restoration, and it is shown in a 1.33:1 aspect ratio. 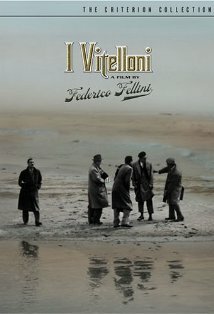 There is a theatrical trailer, a stills catalog, a half hour long documentary Vitellonismo, featuring interviews with the surviving participants in the film: Interlenghi, Trieste, and assistant director Moraldo Rossi, as well as Fellini biographer Tullio Kezich, and Fellini Foundation director Vittorio Boarini. It is informative and not too fellatric in its praise of Fellini. Finally there is an insert with an essay by author Tom Piazza, and its neither good nor bad, simply a recap of plot points and production tales. I Vitelloni is not great cinema, but it is an important film in the Fellini canon, biographically, in its ability to be a Rosetta Stone to other key moments and images in later films of his. It is a film that, at first blush, seems like a simple melodrama, but upon rewatch shows colors not seen the first time. It also augurs a theme that Fellini would satirize to grand fruition in La Dolce Vita, his masterpiece: the anomy of modern human existence. There was a time when life was arranged- marriages and apprenticeships. But Fellini was alive at the time that changed, and the modern loner was born. It would take a landsman- Martin Scorsese- in a different country, to realize the end results of that anomy, in his masterpiece, Taxi Driver. But without the vitelloni there is no Mean Streets nor Travis Bickle. You got a problem with that?